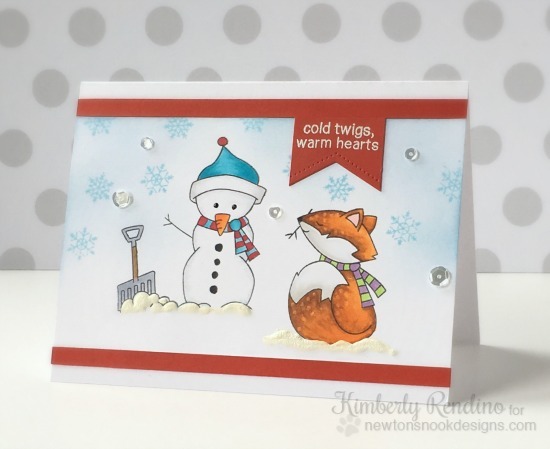 Cute Snowy Scene by Kimberly! This card by Kimberly will totally make you smile! Isn't it adorable how she has the fox holding the arm from the snowman? Do you think he's helping build the snowman or stealing his arm? Either way, it's adorable!! She used the snowman image from the Frozen Friends stamp set and the fox image from our Fox Hollow stamp set. The puffy snow underneath the two characters and the shovel adds such a fun touch. I also love the "cold twigs, warm hearts" sentiment stamped onto the little banner! Such a fun winter scene! Thanks, Kimberly for the awesome card today! You can head over to her blog, Kimplete Kreativity to see more of Kimberly's fun creations! Such a cute and creative combination of stamps! Absolutely darling! Everyone needs a little helper to lend a hand *grin*! Cute card. I like the added falling snow as well as snow banks. Wow! Super sweet! Adore the cute creatures and color choice! Super cute card with lovely details! !